I swear -- when it comes to wash and go's I'm never satisfied. I'm always looking for the next best curl definer, the greatest leave-in and product combo, the best way to sleep on these curls, and of course, the best way to apply product to get exactly what I want: a little volume, plumped and clumped curls, and definition that will last me a good 4-5 days. 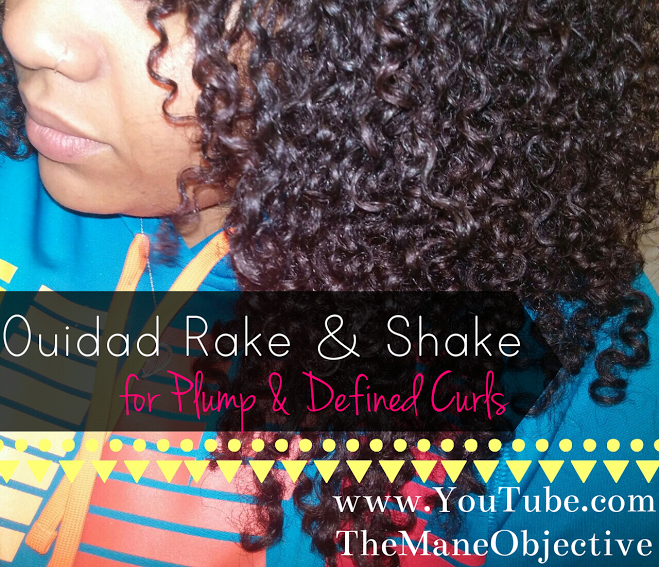 Enter: the Ouidad Rake & Shake technique. The technique isn't brand new, Ouidad stylists have been doing it since Jesus left. If you can believe it, the curly hair brand has a special way of applying products for maximum results. I learned about the technique about a year ago, when I was poking around online trying to decide which "salon set" I'd be claiming. Turns out, I'm a Devachan cut girl (that Ouidad Carve & Slice cut gives me night terrors), and a Ouidad style girl. The best of both worlds, in my opinion. All of the videos I found from Ouidad showed ladies with looser textures (like seriously, 2A hair) getting their Rake & Shake on -- but I was hard pressed to find a video of it on more highly textured hair. Hopefully this video can help bridge the information gap a little -- some techniques and methods can be universally applicable. The Rake & Shake was developed as a technique to define curls, encourage clumping without sacrificing too much in the way of volume. The method guarantees even distribution of product and minimal frizz -- and promises perfect curls every time. As you can see, the results in this video really cosign on the claims that the Ouidad folks make. 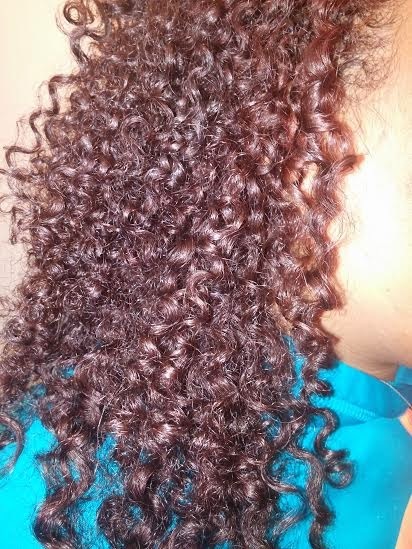 Rake & Shake has given my curls new life! No more frizzy roots, no more randomly stringy ramen noodle curls. I even found that while letting my curls air dry, I didn't have to pin them back like I normally would to create that elongation in the front (thanks to the fact that it shrinks considerably more than the back half of my hair). For all the ladies like me with multiple textures, this is a total game changer. The Rake & Shake method is really simple, and involves only a few minor adaptations from how you probably already apply product to your hair for wash and go styling. Really, it's modified shingling. In this video, I styled my wash and go with As I Am Leave-In Conditioner, Sunny Isle Jamaican Black Castor Oil, and Eco Styler Argan Oil Gel -- the yellow one. My hair is freshly cowashed and deep conditioned, and divided into five sections to make things easier. I applied my leave-in and JBCO in the shower, so I'm keeping a spray bottle handy just in case my hair starts to dry. Remember -- the best wash and go's happen on WET hair! 1. Take a generous amount of your curl definer of choice and apply it to the root, then smooth and rake it through the entirety of the larger section. Really work it in so it coats all the strands. Then, take a smaller section within that larger section and move the rest of the hair out of your way. 2. Starting at the root, rake your fingers through your hair. Rake thoroughly 3 or 4 times, so that your hair is evenly clumped between your fingers. This is going to give you more plump clumps of curls. 3. On the last rake, stop just short of letting the hair go. Holding on to the ends, gently shake the hair up and down a few times to set the curl. Make sure that you're holding the hair in an outward motion, away from your scalp. This ensures that your curls will be defined to the root, but won't fall flat. 4. Repeat steps 1-3 throughout each section of your hair. 5. Air dry, diffuse, or use a combination of both. I personally prefer to air dry (I live in LA...it's still 80 degrees every day). See? Not bad at all. Took me all of 15 minutes to rake and shake my entire head. Now air drying, that's another story. Regardless of what product I use, it's an all day process. But let's talk about how my Rake & Shake curls stood up to the beating they took during my 2 hour workout thoooooo! Have you ever tried the Rake & Shake technique? Love the article I just think the Jesus comment was a bit offensive.